Festival Mall in Alabang, Muntinlupa City launched the “Unity in Pink,” a month-long breast cancer awareness campaign last October 3 at the River Park Activity Court. 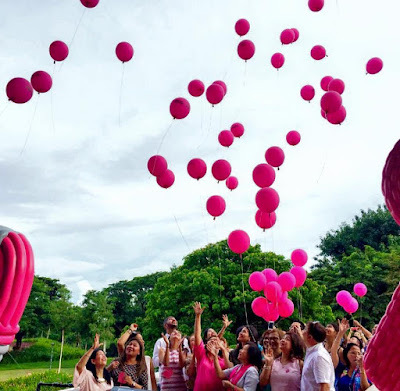 Despite advances in technology, one in thirteen Filipino women is still diagnosed with breast cancer, and most of these cases are discovered too late. Part of this is lack of awareness for the disease. That is why early detection for women is always encouraged. Unity in Pink marks the third celebration of Festival Mall’s Pink October campaign, a yearly celebration of women’s health and awareness for breast cancer, one of the top women’s health issues in the country. Since 2013, the mall has partnered with breast cancer and women’s health organizations such as the ICanServe Foundation, Project Pink, Asian Hospital Charities, and the Gender and Development (GAD) Office of Muntinlupa City to help promote early detection amongst women vulnerable to the disease, as well as wellness for women. Advocates who graced the occasion were Trina Biazon, head of the Muntinlupa GAD, Melissa de Leon of Project Pink, Lani Eusebio of the ICanServe Foundation, and Kris Yabes of the Asian Hospital Charities. There will also be a Hope Wall where shoppers and diners at the mall can write messages of encouragement for breast cancer patients and survivors. Unity in Pink will be a month-long event featuring discounts, wellness activities, breast cancer awareness talks, free consultations, and other activities for women to promote health. On October 8, 10 am, the ICanServe Foundation, in cooperation with the Muntinlupa GAD will launch “Ating Dibdibin,” a breast cancer awareness talk. Meanwhile, great discounts for women are available at the Shopaholic Goes Pink sale running the whole month of October. Mossimo partners with Festival Mall for the Fashionably Pink fashion show on October 23, 3 pm. The yearly campaign has already been lauded with a Silver Anvil Award the Exhibits and Special Events category, as well as another Silver Award for the External Consumers, Communities, Special Interest / Advocacy Groups category at the 51st Anvil Awards held in 2015. Festival Mall is a Filinvest Lifemall. It is the center of attraction within Filinvest City and is considered the heart of the city. The Filinvest mall group is also ensuring that its upcoming mall developments in other locations such as Il Corso in City de Mare, SRP Cebu, FORA in Tagaytay among others will constantly resonate the same value of a Filinvest Lifemall. And as its new branding and tagline goes, “It’s where the City’s heart beats.” It is a premier development in Filinvest City, Alabang, Muntinlupa City. It is the only mall with five anchor stores: Shopwise Supercenter, SaveMore, Robinsons Department Store, Ace Hardware and Handyman. It has over 700 shops, a total of 2,300 multilevel parking slots, various food outlets, and indoor amusement rides.